I am honored to serve as chair of the Law Firm Challenge. Since its inception, the Challenge has provided crucial support to USD School of Law and has demonstrated the incredible strength of our growing regional alumni network. Given the success of Dean Stephen Ferruolo's Scholarship Initiative, and the importance of scholarships to the law school, increased scholarship funding remains the top fundraising priority. I hope we will all celebrate the dean's leadership in creating meaningful scholarship opportunities for deserving candidates to attend the law school with our most successful Challenge to date. Much of the success that USD School of Law has experienced this year in admissions, law school standings and bar passage rates is due in large part to your support and dedication. This year's entering class was quite impressive. In fact, USD stood strong in the face of declining law school admission rates in California. This was, in part, thanks to your generosity. Last year's Law Firm Challenge provided scholarships, supported clinical opportunities, and, through your participation, demonstrated to our current and prospective students the strength of our alumni network. When making your gift, I hope you will consider making a gift of $1,500 and joining the USD School of Law Maudsley Fellow Society, it is a wonderful community of law alumni and friends. Your membership gift will increase both your personal involvement with the law school and the impact of your firm's participation in the Law Firm Challenge. If your firm or company is not yet part of the Challenge, sign up now. Please join me in investing in our alma mater and supporting the students we will soon be privileged to call colleagues. 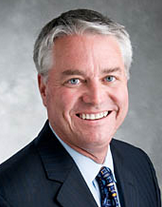 Steve Cologne assumed the Managing Partner role in 2017. He joined Higgs Fletcher & Mack in 1999 after previously enjoying 15 years as an associate, partner and shareholder with the law firm of McInnis, Fitzgerald, Rees & Sharkey, then San Diego's premier litigation firm. Mr. Cologne practices in the area of complex tort and business litigation. Currently, he focuses on employment litigation and trial of complex contract and business matters.